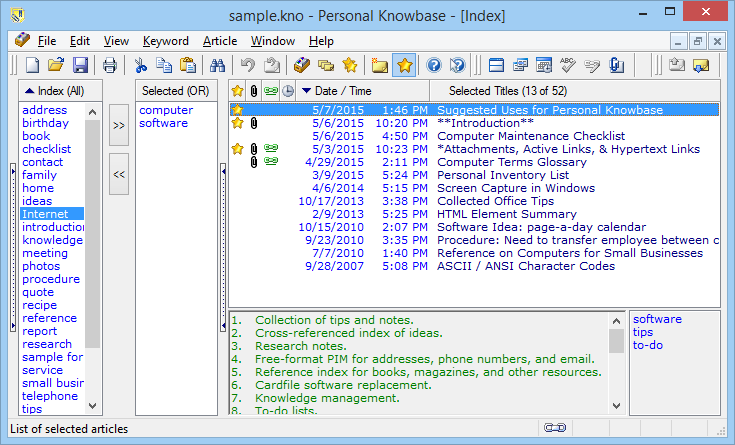 This is an example of Personal Knowbase's Index Window, which shows the keywords and the titles of the articles (notes) in your data file. Use the Index Window to view a summary of your information and to retrieve the information you need. The optional Preview Pane can show the content of the article highlighted in the Titles column and the keywords which are common to all highlighted articles. The Date and Time columns are also optional.